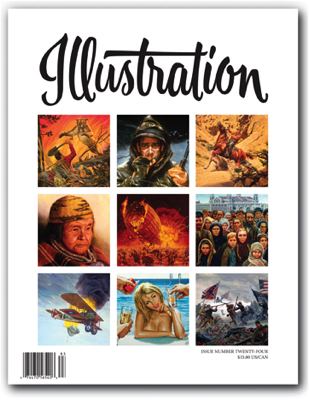 In this issue: The life and work of the incredibly proflic Mort Kunstler. Mort's work encompasses practically every genre of illustration you can imagine, from movie posters and paperback covers, to men's adventure magazines, model kit boxes, and Civil War lithographs. The man has done it all, and this "Special Issue" devoted to his work attempts to capture an overview. 96 pages in full color. Sold out.